DALLAS — Before leaving for the United States, Laura Oppedisano made a promise to herself. Oppedisano left her home in Bergamo, Italy, a few weeks ago eager for new experiences in a foreign country. She admits it’s a bit scary, but Oppedisano has enjoyed her time so far as an exchange student at Dallas High School, including being a member of the cross country team. Having never run cross country before, Oppedisano joined the team to meet more people and be more involved with the school. Dallas coach Monique Lankheet said Oppedisano has been adapting quickly. Oppedisano has competed in one race so far for the Dragons, when she ran in the Ultimook Race Nike Invitational on Sept. 2. She had a time of 32:44.4, which placed her 84th out of 171 runners in the junior varsity race. Oppedisano, who chose cross country because she has always enjoyed running on her own, will spend the school year in Dallas, then return home to Italy for one final year of high school. Oppedisano has always enjoyed traveling the world with her family, and she decided to study in the U.S. after a trip she made recently to New York City. 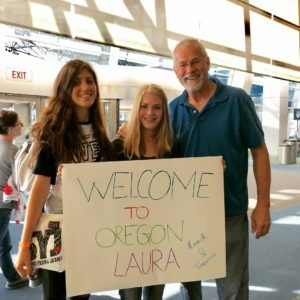 It can be difficult to be so far away from home as a teenager, but she appreciates the help she’s getting from her host sister, Francesca Dow. While she works to improve her English, Oppedisano is in the process of learning Spanish. She also enjoys studying anatomy and hopes to pursue a career in veterinary medicine. Oppedisano has a passion for animals, and when she’s not studying or running, she enjoys horseback riding. Her host family has two horses, so even away from home Oppedisano finds time to ride in Dallas. Even though she’s able to get her horse fix here in the U.S., there is one specific animal back in Italy that she misses. Oppedisano stays in regular communication with her family in Bergamo, a city 375 miles north of Rome with about 120,000 people. Despite her short time in Dallas, Oppedisano is quickly making friends on the cross country team and in the school. When Oppedisano left Italy, she didn’t know what to expect, but so far she is enjoying Dallas. Not only are the people friendly, she said, but she also enjoys the rural atmosphere that Dallas and the Mid-Valley offer.